In the interest of full documentation of the year’s events (but because we’re running short on time), a brief post summarizing all of the unsummarized Observing Logs for the past few months (we’re done with observing for 2015 unless something really interesting happens tomorrow night!). Despite mostly unfavorable conditions, we did manage to get a few decent sessions in. In advance of International SUN-Day on June 21st, CNYO hosted a combined solar astronomy lecture and nearly clouded-out observing session. Provided the sky is clear (which was mostly NOT the case for the 2015 SUN-Day festivities), we’ll be running a session for International SUN-Day 2016 somewhere around town. 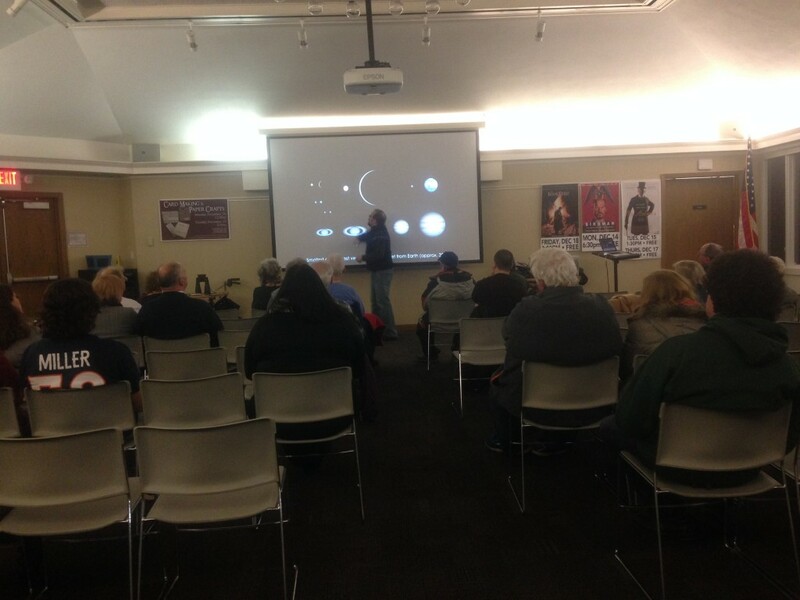 A “general introduction to astronomy” lecture was the staff request for this session, including a bit about getting around the CNY Nighttime Sky (courtesy of CNYO’s handy-dandy brochures) and a little sneak-in of the New Horizons (Pluto!) and Dawn (@ Ceres!) missions. For the record, one of the aesthetically pleasing libraries in CNY. After a rescheduling of the October 22rd lecture due to pending social obligations, CNYO returned for our twice-yearly (or more) LPL lecture, featuring a more complete session about Ceres and Pluto and all that it means to be dwarf planets in our always-interesting Solar System. CNYPCUG (but by “PC,” they mean “Tech”), which meets monthly at LPL, saw the announcement for the November 23rd session and asked for a tech-centric lecture of their own. Mixing up some of the recent dwarf planet discussion with the flurry of missions already active (with an extra emphasis on Hubble imagery), this session ran over 90 minutes and had lots of good discussions to boot. 2015 wasn’t a truly bad year for observing, but trying to get clear skies, little-to-no Moon, and short-notice organizing all together for some of our hoped impromptu sessions just didn’t work out too well. The four official sessions on the books are listed below. This, THIS session was a treat. Driving out to Baltimore Woods around 8:00 p.m., the sky was completely overcast with only a few patches of anything clear-like in the distance. Within 5 minutes of BW, however, the sky just opened right up, with some of the last cloud cover making for some excellent final views of the obscured Moon before the whole sky went clear. 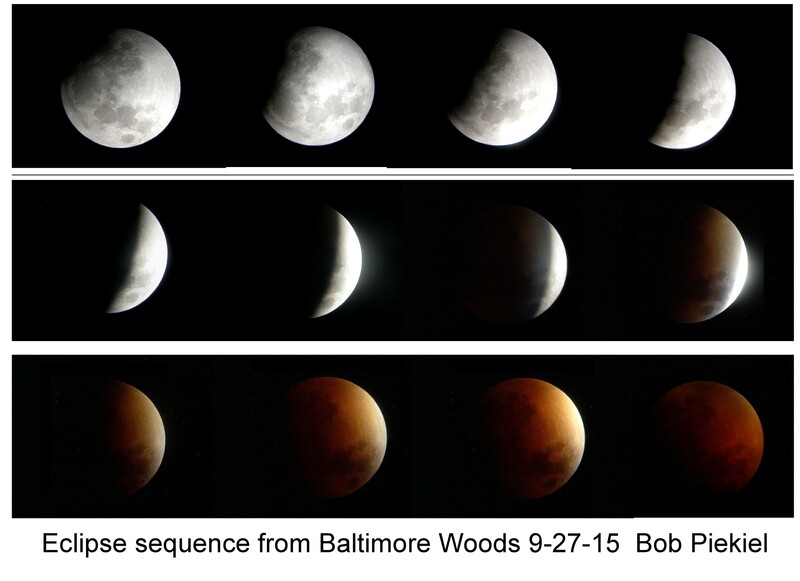 Over 50 people were at the session, which culminated in a beautiful full lunar eclipse. The best part of the whole session – and the one I made mention of for people to take a second look – was just how bright the restive the sky becomes when the Moon is dimmed so significantly. One could have had a full New Moon observing session, complete with galactic views and all the subtle highlights one could wish for, all while having this dark orange/red Moon *right there* in the sky. Bob Piekiel was kind enough to make a montage of the event, which I include above (click for a larger view). This session was mostly organized on our Facebook Group and even received a small but active (8) attendance (including a guest appearance by New Moon Telescope’s own Ryan Goodson) despite a clerical error in the organization itself not allowing us to make it through the gate (so, not wanting to waste a clear sky, we unloaded and observed from the long NSC driveway – the field being too far away to want to risk carrying scopes around). A shining example of Murphy’s Law of Astronomy – “If you schedule it, it will be cloudy. If you cancel, it will be clear.” The session was scheduled for December 4th, with the 5th and 6th as alternates. The 4th was a wash, and the 5th looked to be – until we cancelled the session, after which those who still attended reported having an hour of clear skies for observing. We set the 6th as a make-or-break session – which mostly broke. Despite a busy 70 minutes with 18 attendees, we were only able to catch a poor view of the Andromeda Galaxy and a moderately washed-out view of the Pleiades. The discussion more than made up for the weather, however, and we plan to return again to try our luck near the heavily lit Corcoran High School football field (sadly, Nottingham High School does not fare much better). As far as reported observing, this session went solely to Bob Piekiel at his special session at Baltimore Woods. With a one hour clearing on the evening of the 13th, Bob and his two attendees managed six bright meteors and a number of deep sky objects before packing it up. The 14th, sadly, was not an option for observing due to increased cloud cover, meaning CNY, yet again, largely missed out on one of the great meteor showers. The 2016 calendar is getting populated and plans are in the works for more sessions. Stay tuned and Happy New Year! 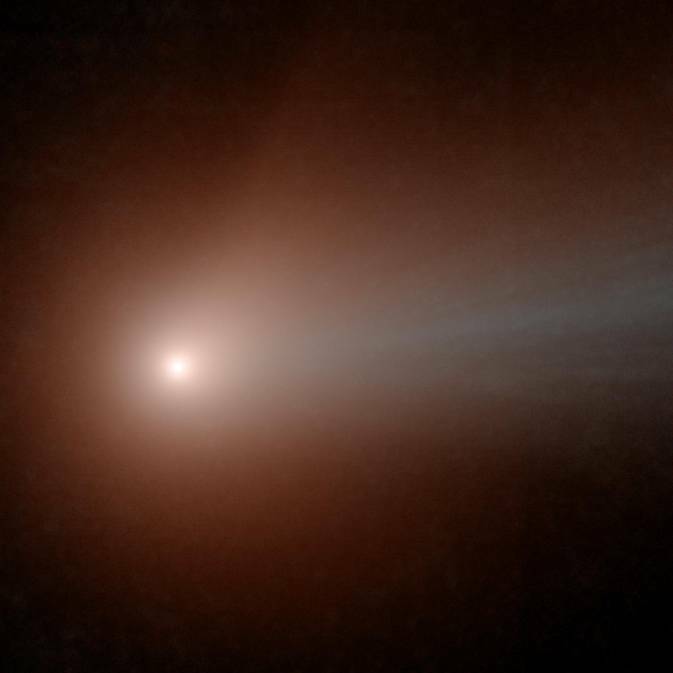 Millions of images of celestial objects, including asteroids, observed by NASA’s Near-Earth Object Wide-field Infrared Survey Explorer (NEOWISE) spacecraft now are available online to the public. 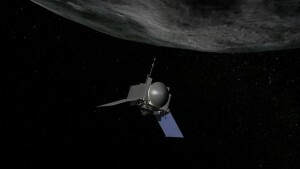 The data was collected following the restart of the asteroid-seeking spacecraft in December 2013 after a lengthy hibernation. The collection of millions of infrared images and billions of infrared measurements of asteroids, stars, galaxies and quasars spans data obtained between December 13, 2013, and December 13, 2014. “One of the most satisfying things about releasing these cutting-edge astronomical data to the public is seeing what other exciting and creative projects the scientific community does with them,” said Amy Mainzer, principal investigator for NEOWISE at NASA’s Jet Propulsion Laboratory (JPL), in Pasadena, California. 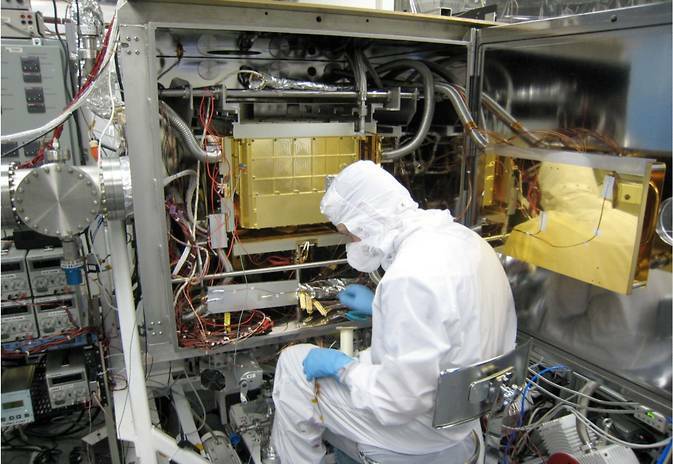 NASA’s Curiosity rover is using a new experiment to better understand the history of the Martian atmosphere by analyzing xenon. While NASA’s Curiosity rover concluded its detailed examination of the rock layers of the “Pahrump Hills” in Gale Crater on Mars this winter, some members of the rover team were busy analyzing the Martian atmosphere for xenon, a heavy noble gas. Curiosity’s Sample Analysis at Mars (SAM) experiment analyzed xenon in the planet’s atmosphere. Since noble gases are chemically inert and do not react with other substances in the air or on the ground, they are excellent tracers of the history of the atmosphere. Xenon is present in the Martian atmosphere at a challengingly low quantity and can be directly measured only with on-site experiments such as SAM. “Xenon is a fundamental measurement to make on a planet such as Mars or Venus, since it provides essential information to understand the early history of these planets and why they turned out so differently from Earth,” said Melissa Trainer, one of the scientists analyzing the SAM data. This Earth Day, April 22, NASA is asking people around the world to share pictures and videos on social media that show there is no place like home – planet Earth. NASA’s Earth Day #NoPlaceLikeHome project seeks to get the public involved in highlighting the great diversity of the places, landscapes and ecosystems of our home planet. Participants are invited to post photos and videos that answer a simple question: What is your favorite place on Earth? 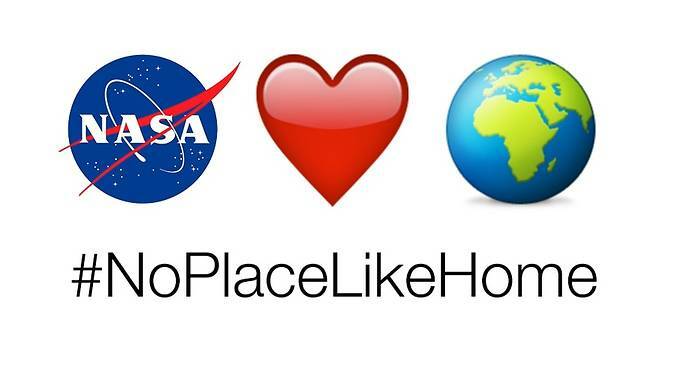 Images can be shared using the hashtag #NoPlaceLikeHome on Twitter, Instagram, Vine, Facebook, Google+ and Flickr. Leading up to Earth Day, NASA will participate by posting its own images and videos. 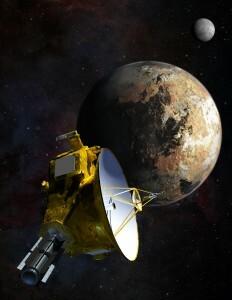 The public has until Friday, April 24 to help name new features on Pluto and its orbiting satellites as they are discovered by NASA’s New Horizons mission. 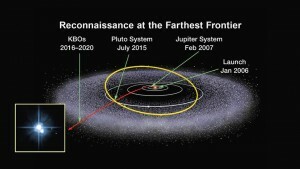 Announced in March, the agency wants to give the worldwide public more time to participate in the agency’s mission to Pluto that will make the first-ever close flyby of the dwarf planet on July 14. The campaign extension, in partnership with the International Astronomical Union (IAU) in Paris, was due to the overwhelming response from the public.